A fresh coat of paint can transform your bathroom! So you need to paint your bathroom? Before you begin your bathroom painting project, there are a few things you should know and try to keep in mind. Keep reading and discover a few easy steps for the best bathroom painting results possible. Many people choose the wrong paint finish when painting their bathroom. Generally speaking, you want to stick to either a semi-gloss paint or a satin. This is because a bathroom is a moist environment and these types of paint will hold up better over time. Also, they are easier to clean than other types of paints since they can be wiped down without losing their finish. 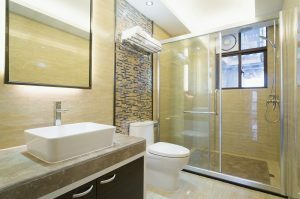 Bathrooms need proper ventilation because high humidity can ruin your painting results. After you shower or take a bath, always be sure to turn on the ceiling fan, exhaust fan, or open a window. It is important to realize that exposure to high levels of humidity can damage the paint on the walls. Before you crack open your first can of paint, you need to do some prep work. In addition to protecting surfaces, you need to remove outlet covers, shelving, and clear the counter tops. You can use either drop cloths of newspaper to protect your countertops and other surfaces.